Percy Jackson and the Olympians: The Lightning Thief, the movie, came out recently in 2010 and is rated PG. The story is about a young man who discovers he is the descendant of Poseidon, god of the sea, and is cast into an adventure to reach the gates of the Underworld and prevent a catastrophic war between the gods. 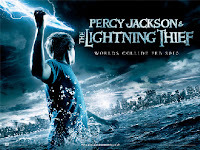 As his quest unfolds, Percy Jackson, the main character, encounters many of the Greek gods such as Zeus, Hades, Athena, as well as monsters and ancient Olympians. The unfortunate thing about the movie is that not a single scene is filmed in Greece. That slightly defeats the purpose of my Movie Monday films introducing beautiful European scenery to your youngsters. But the movie is not actually what I'm promoting here. My son and daughter enjoyed the movie because they thoroughly enjoyed the book series. They both read all five of the books while in elementary school. The five titles by Rick Riordan are: The Battle of the Labyrinth, The Titan’s Curse, The Sea of Monsters, The Lightning Thief, and The Last Olympians . Greek mythology , with its tales of heroes and villains, is fascinating to school-aged kids. And if there's a trip to Greece in your family's future, it's essential that you expose them to the characters and legends of Greek mythology so that they understand the significance of the ancient relics they'll see there. The Temple of Athena in Athens, Mount Olympus, the innumerable sculptures and reliefs of the gods, and the history of Greece will excite your child when he or she can relate it to a story. 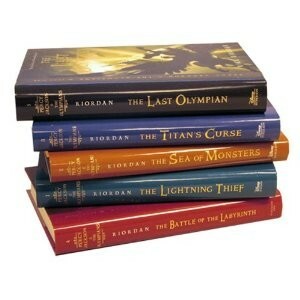 Introduce ancient Greece to your family with Rick Riordan's Percy Jackson series. I have been reading this series with my kids. We just finished book four last night. After we read the first book we watched the movie. My kids learned how much better a book can be than a movie version. Yeah, my kids liked the books better, too. Seems the movie tried to wrap the whole series into one story for the movie.